The following update comes from Zyzzyva creator, Michael Thelen. If you're not familiar with these names, you might like to read this interview I did with Michael some time ago. This update includes the CSW12 word list, thanks to WESPA and HarperCollins. After installing Zyzzyva 2.1.4, if you are interested in using CSW12, make sure to click the Preferences button, then the Edit button next to Load Lexicons, then activate the checkbox next to CSW12. 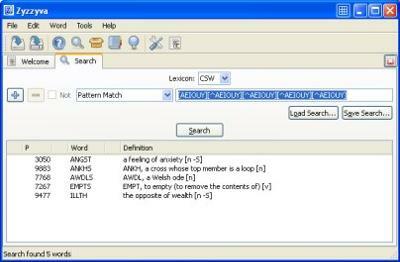 You will also probably want to rebuild all your lexicon databases to get updated word definitions and lexicon symbols. One clarification about the Spanish FISE2009 lexicon, for those who play Spanish Scrabble. Zyzzyva is still unable to translate the digraphs CH, LL, and RR as single characters, so these are encoded as 1, 2, and 3 respectively. Also, Ñ is encoded as 4. I apologize that I haven't been able to fully implement a user-friendly Spanish solution, but I also felt that continuing to leave out the FISE lexicon would be unacceptable. I hope this solution will work for now, and I will improve it in future releases. I hope you enjoy using Zyzzyva, and most of all, have fun with it! Many persons in these days are worried within the growth of Linux, if any new malicious program is presented then they are going to acquire the resolution of the in no time. They prepare dinner its protection system, rock solid, no virus or worm can sneak into this approach. Linux has launched countless of variants; Red Hat Linux would be the exceptional. So to appreciate and function this system you must possess a accurate expertise about this. Purple Hat Certification would be the 1 that may furnish you with the knowledge you would like to participate in the every single variety of motion in Linux. Thanks for including the FISE lexicon in your software. The community would appreciate it. Looking forward to seeing more features in the future.